From the ranks of the Death Knights comes Teron Gorefiend. The death of Gul’dan has placed these dark horsemen under the authority of no clan, but Gorefiend shares the desires of Ner’zhul to open numerous Portals. He offers his influence over the Death Knights of Draenor in exchange for a world that the Death Knights can claim as their own. 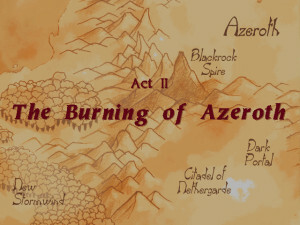 Using the knowledge gained at the defeat of the Ogre-Mage Mogor and the necromantic powers of the Death Knights, Ner’zhul successfully awakens the arcane energies of the mystic rift. As you lead the forces of Shadowmoon into Azeroth, a human battlement that has been constructed to keep the Portal closed stands before you. Destroy this Citadel and claim the lands that surround the rift.